Django provides built-in methods to validate form data automatically. Django forms submit only if it contains CSRF tokens. It uses uses a clean and easy approach to validate data. 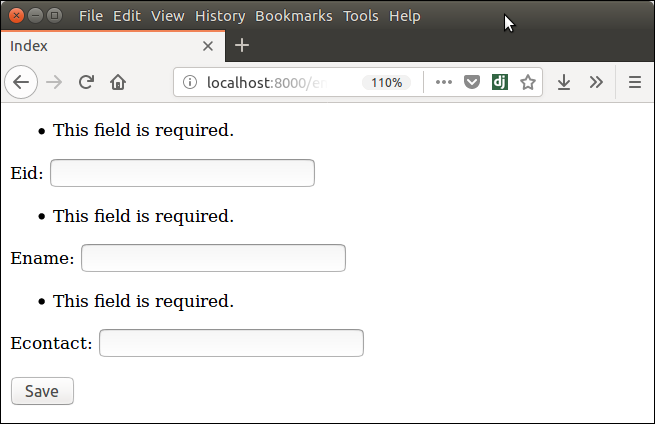 The is_valid() method is used to perform validation for each field of the form, it is defined in Django Form class. It returns True if data is valid and place all data into a cleaned_data attribute. Let's see an example that takes user input and validate input as well. This example contains the following files and code. Now, create a form which contains the below code. from django import forms from myapp.models import Employee class EmployeeForm(forms.ModelForm): class Meta: model = Employee fields = "__all__"
Instantiate the form, check whether request is post or not. It validate the data by using is_valid() method. Index template that shows form and errors. Start server and access the form. It validates each field and throws errors if any validation fails.